Admission: $5 VIP button helps with the cost and gets you a VIP seat. Otherwise, free. Event Parking: Park at Sharon Elementary School or Newburgh Presbyterian Church for a shuttle bus to take you to the riverfront. Shuttle buses start running at 5:00pm. You can also park in the parking lot at People’s Bank located at 705 State St., Newburgh, IN 47630 for a shuttle ride to the riverfront. 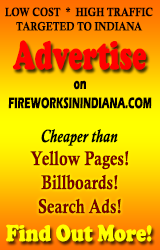 The fireworks is a community event paid for by the community. There are business sponsors; but it is important for individuals to help fund the fireworks by buying a button from a local merchant or by donating. You can donate at the link above.